Note: Growth in average wages measures average wages of production/nonsupervisory workers in the private sector. Inflation measured using the CPI-U-RS and the average of January-June for 2016. Productivity is measured as total economy productivity net depreciation. The federal minimum wage is meant to ensure a fair wage for the nation’s lowest-paid workers. But it hasn’t done that since 1968. Since the inception of the federal minimum wage in 1938, Congress has periodically raised it, ostensibly so that its real (inflation-adjusted) value would reflect changing economic circumstances. Before 1968, the real value of the federal minimum wage grew at roughly the same pace as the growth in labor productivity—i.e., the rate at which the average worker can produce income from each hour of work. This makes sense: if the economy as a whole can produce more income per hour of work, it means there is capacity for wages across the distribution to grow at a similar rate. But after 1968, when the real value of the minimum wage in today’s dollars was $9.63, the minimum wage stopped rising at the same pace as productivity. As the top line in the graph shows, had the minimum wage kept pace with rising productivity, it would be nearly $19 per hour today. Not $7.25. This is only one way in which policymakers have failed to ensure that the lowest-paid Americans get their fair share of economic growth and improving labor productivity. 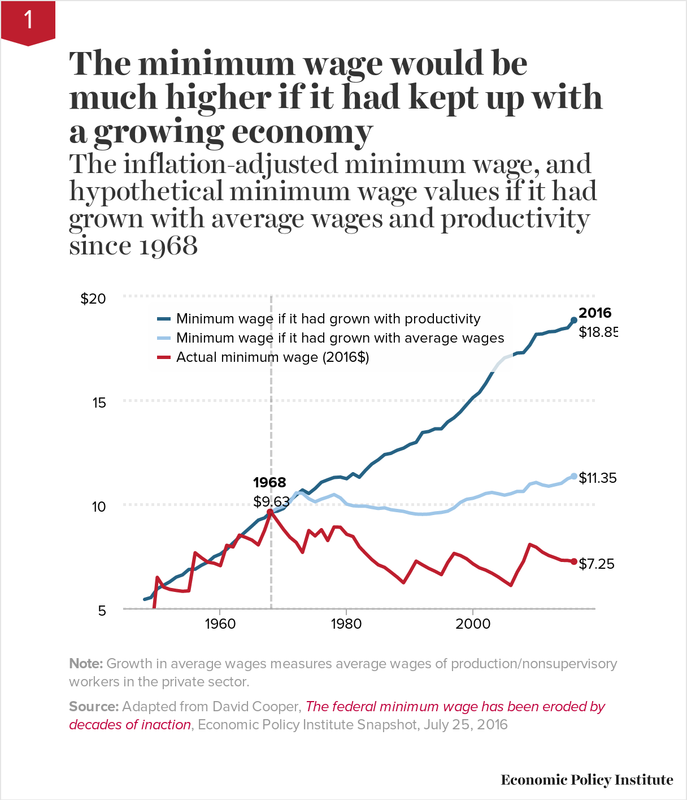 As the middle line in the figure shows, if, since 1968, the minimum wage had even just been raised at the same growth rate as average hourly wages of typical U.S. workers, the minimum wage would be $11.35 today. To sum up, minimum wage workers are falling behind not only productivity growth but typical worker pay growth and pay growth of their 1968 counterparts! And as the next chart shows, typical workers (measured here as the nonsupervisory production workers who constitute roughly 80 percent of all private-sector U.S. workers) themselves are lagging behind highly paid supervisors and executives when it comes to claiming a share of economic growth. Note: CEO annual compensation is computed using the “options realized” compensation series, which includes salary, bonus, restricted stock grants, options exercised, and long-term incentive payouts for CEOs at the top 350 U.S. firms ranked by sales. Typical worker compensation refers to annual compensation of the workers in the key industries of the firms in the sample. The compensation of the CEOs of the largest firms has grown much faster than stock prices, corporate profits, and the wages of the top 0.1 percent. But the most dramatic difference is between the compensation of CEOs and the compensation of typical workers. From 1978 to 2015, CEO compensation grew 941 percent compared with just 10 percent for the compensation of a typical worker (annual compensation of the workers in the key industries represented by the sample). The figure illustrates the gap in pay between CEOs and employees by tracking the ratio of CEO compensation to that of the typical worker. CEOs of major U.S. companies earned 20 times more than a typical worker in 1965; this ratio grew to 59-to-1 by 1989, and then it surged in the 1990s, hitting 376-to-1 by the end of the 1990s recovery, in 2000. The two stock market crashes after 2000 reduced CEO stock-related pay and caused CEO compensation to tumble. But by 2014, the stock market had recouped all of the value it lost following the 2008 financial crisis and the CEO-to-worker compensation ratio was back to 302-to-1. A dip in the stock market and the value of associated stock options led to a decline in CEO compensation in 2015 and, correspondingly, the CEO-to-worker pay ratio fell to 276-to-1, similar to what happened in other stock market declines at the start of the new millennium and during the Great Recession. 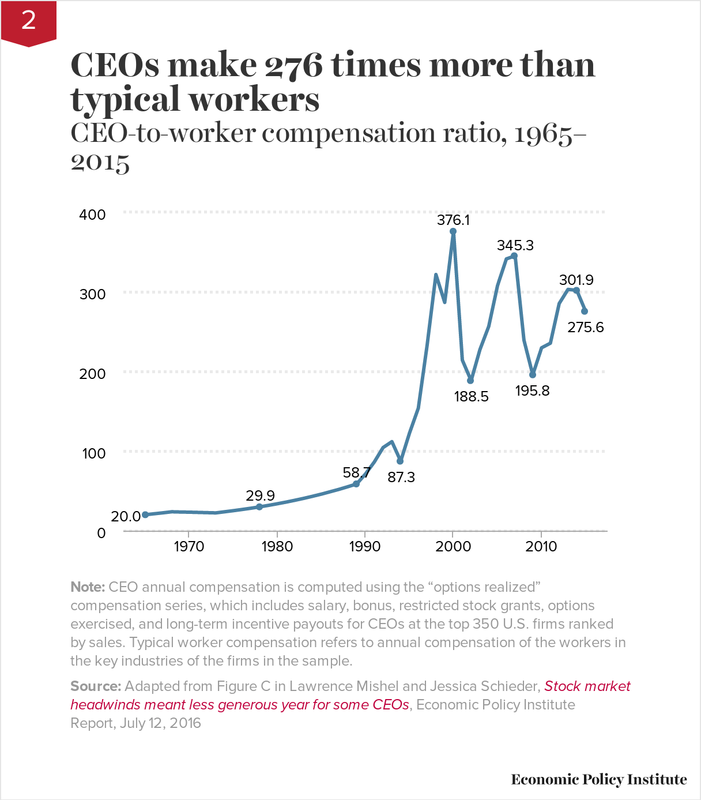 Though the CEO-to-worker compensation ratio remains below the peak values achieved earlier in the 2000s, it is far higher than it was in the previous four decades. Note: Data are for average hourly compensation of production/nonsupervisory workers in the private sector and net productivity of the total economy. “Net productivity” is the growth of output of goods and services minus depreciation per hour worked. The root cause of the extraordinary rise in inequality and the near-stagnant growth of wages for typical workers over most of the past generation is the pay-productivity gap. Before the late 1970s, wages of the vast majority of workers grew in line with productivity. In the late 1970s, typical worker pay growth split from economy-wide productivity growth. Productivity is a measure of how much income is generated in an average hour of work in the economy. While productivity after 1979 grew more slowly relative to previous decades, it did grow steadily, offering the potential for broad-based wage gains. 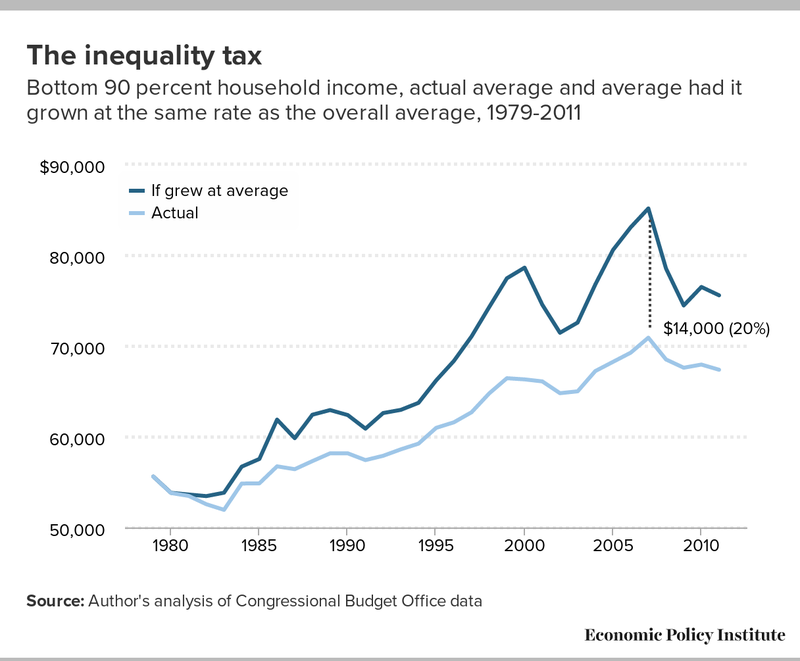 But income gains were not broad-based. In fact, average pay (wages plus benefits) for the 80 percent of the private-sector workers who are not supervisors barely budged in that time. The growing wedge between productivity and pay is the income generated by workers in the economy that has been claimed by corporate owners and managers and others at the very top of the pay scale. Closing the pay-productivity gap must be a part of an agenda to improve women’s economic security. Although the gap between what median men and median women are paid has narrowed (albeit too slowly) since 1979, the gap between typical workers’ compensation and economy-wide productivity growth has widened. Tackling both gaps would also raise the economic security of men. One example of why the pay-productivity gap needs to inform our thinking about progress in closing gender pay gaps is the fact that roughly a third of the progress made in closing the median gender wage gap since 1979 was due to the decline in men’s wages in an era of increasing inequality. Remedying unfairness of pay for women is necessary, but wage parity gained simply because male wages dropped is no cause for celebration. 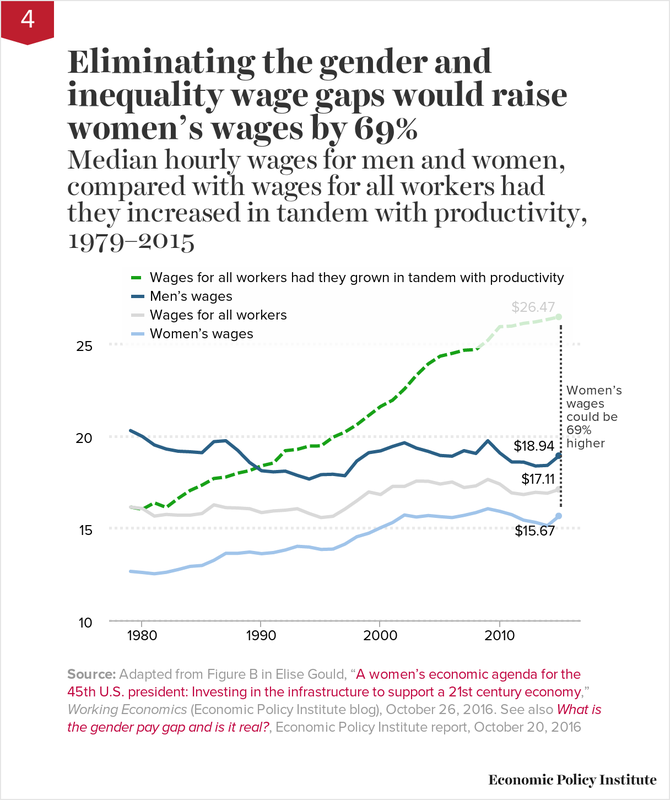 The figure shows how high median wages for women could be if gender wage disparities had been closed between 1979 and today and if the economy had generated wage growth for all workers that matched economy-wide productivity growth. If the gender wage gap were closed and the economy’s gains broadly shared, women’s median hourly wages would be 69 percent higher today ($26.47 instead of $15.67). Notably, men’s median hourly wages would also be 40 percent higher. (To see how these differences compare for age and education cohorts, check out EPI’s new gender wage calculator.) These figures show that getting to gender pay equity is not a zero-sum game—if we also tackle inequality, typical men and women have much to gain. In the wake of Trump’s election, some commentators have focused on the economic failures afflicting white working-class men. White working-class men are suffering, but they are not the only group suffering from the chasm between what the economy can provide and what it is providing, and their loss has not translated into gains made by typical workers of other races. In fact, wage gaps between workers of different races have widened at the same time that economy-wide productivity and wages for typical workers overall have diverged. In short, what has caused sluggish wage growth for the vast majority of all workers is the rise of inequality that has redistributed income toward the very top of the income distribution. 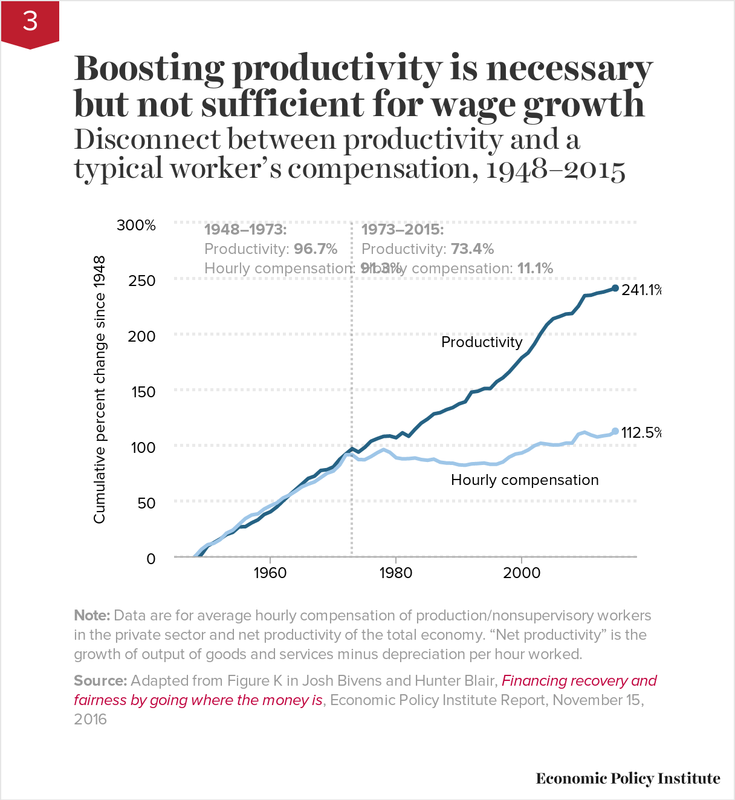 The figure shows that between 1979 and 2015, median hourly real wage growth fell far short of productivity growth—a measure of the potential for pay increases—for men as well as for women and for both black and white workers. And white workers are not losing income to their black counterparts. Median hourly wages of black men fell 5.7 percent, compared with a 1.0 percent decline for white men. Median hourly wages of white women grew 31.6 percent, compared with 15.2 percent for black women. What this figure does not show is that black workers already start out with a big pay disparity. In 2015, black workers overall were paid 26.2 percent less than their white peers. What has this double penalty of overall wage stagnation and regress on racial pay disparities cost black workers? Quite a lot, according to a 2016 report by Valerie Wilson. 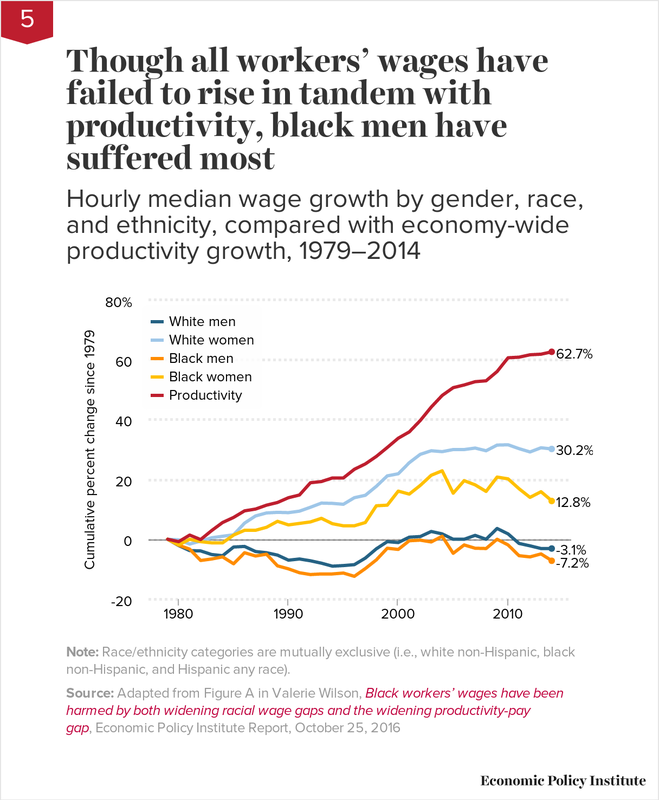 If the 1979 racial wage gap at the median had closed by 2015 and the overall median had grown with productivity (63.9 percent) between 1979 and 2015, the median black worker would be earning an hourly wage of $26.47 instead of $14.14—an increase of $12.33. That means the hourly wage of the median black worker would be an astounding 87.2 percent higher! And under this scenario, the median white worker would also receive an hourly pay increase of $7.30—the difference between $26.47 and $19.17—boosting their wages by 38.1 percent. The vast majority of workers of all races would be better off if we addressed both class and racial inequalities, with larger gains for African Americans because of the dual penalties imposed by class and race. 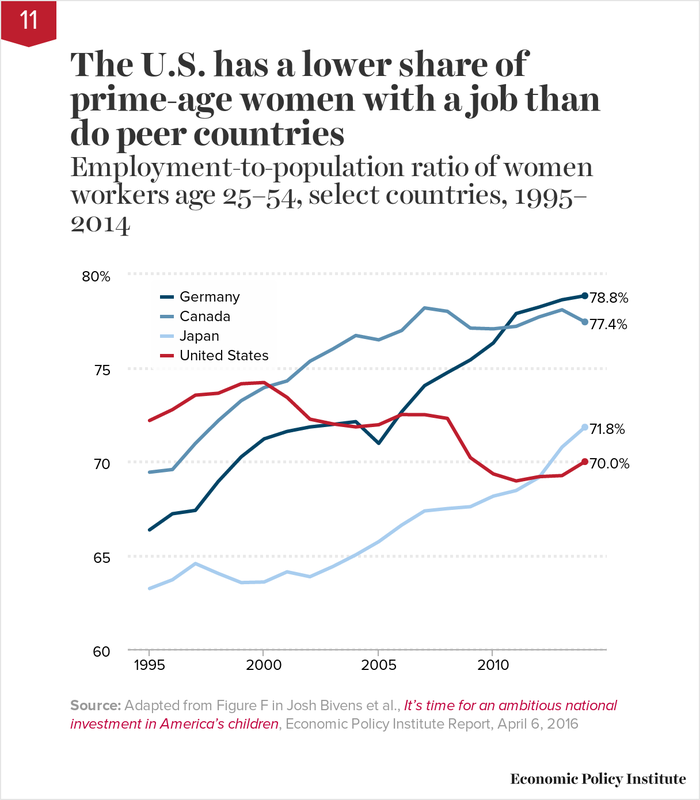 Notes: Sample restricted to nonunion full-time workers in the private sector ages 16 to 64. 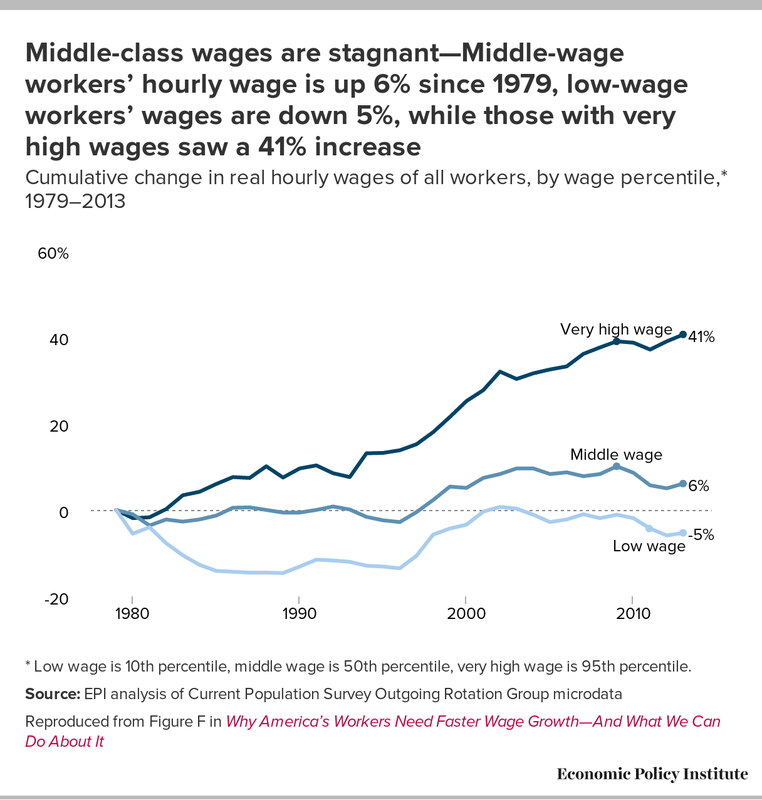 All workers would be better off in terms of wage levels had the right of workers to associate and bargain collectively not been severely eroded in recent decades. Between 1979 and 2013, the share of private-sector workers in a union fell from about 34 percent to 10 percent among men, and from 16 percent to 6 percent among women. This decline in union density has eroded wages for nonunion workers at every level of education and experience, costing billions in lost wages. For the 32.9 million full-time nonunion women working in the private sector and the 40.2 million full-time men working in the private sector, there is a $133 billion loss in annual wages because of weakened unions. This translates to real weekly wage losses for workers. 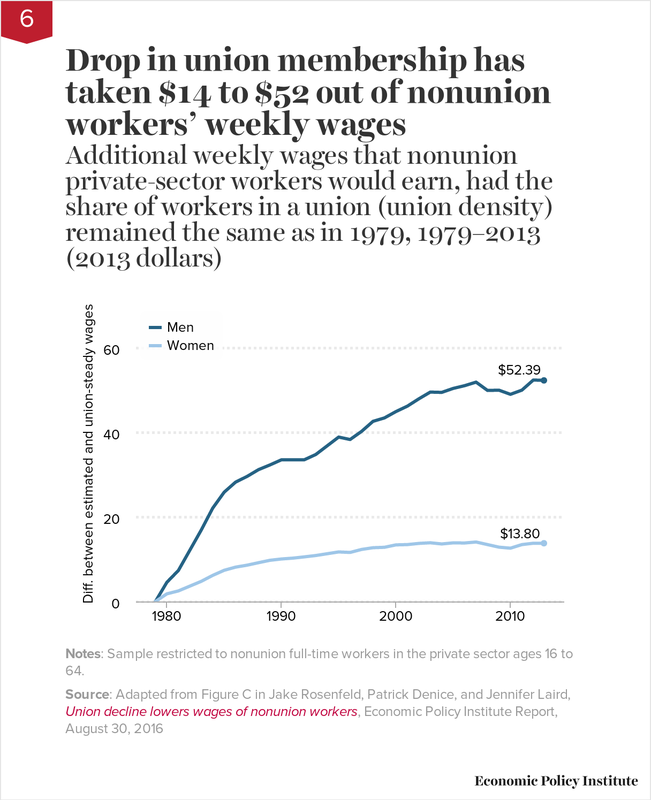 Women would be making $13.80 more a week and men would be making $52.39 more a week, had union density (the share of workers in similar industries and regions who are union members) remained the same as in 1979. Though not shown in the graph, working-class men have felt the decline in unionization the hardest. Specifically, nonunion men lacking a college degree would have earned 8 percent, or $3,016, more in 2013 if unions had remained as strong as they were in 1979. Source: Data are from a new data set compiled by Thomas Piketty, Emmanuel Saez, and Gabriel Zucman. A new data set confirms what we know about the enormous increase in income inequality after 1979. 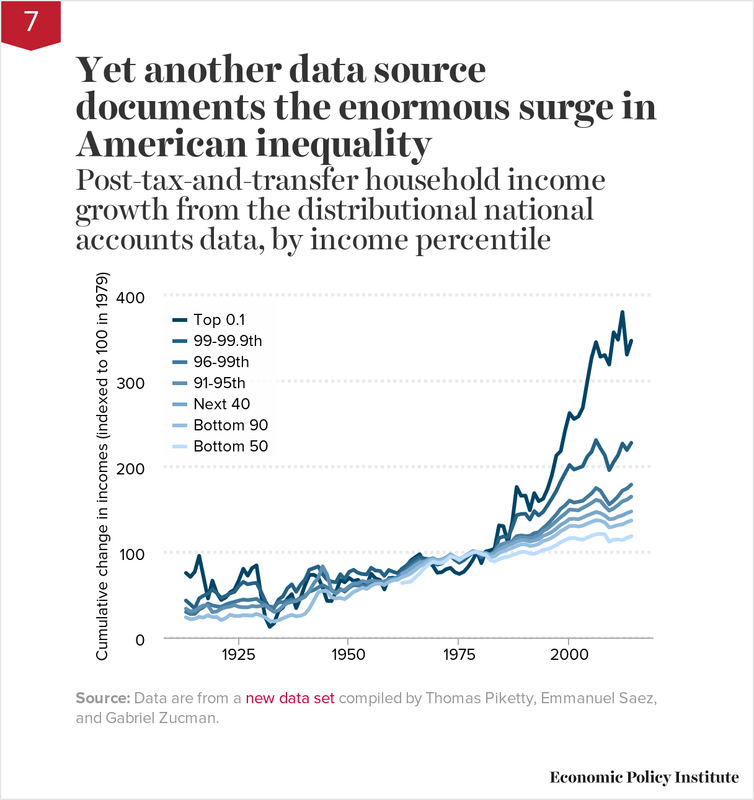 This data set allows us to take another cut at this issue, with all of total national income and its distribution accounted for—market-based incomes like wages and dividends, transfer incomes like Social Security and Medicare, and even the income stemming from direct government purchases. The figure charts incomes (indexed to be 100 in 1979) for the bottom 50 percent of households, bottom 90 percent of households, households between the 50th and 90th percentiles, households in subgroups of the top 10 percent, and the top 0.1 percent of households. The results are clear: households nearer the top of the income distribution have seen far more rapid growth in recent decades. And counting income in the form of government benefits does not close the gap between income growth at the top and the income growth of everybody else. Note: Retirement account savings include 401(k)s, IRAs, and Keogh plans. Scale changed to accommodate larger values. Over the past generation of economic life, the U.S. economy undertook a grand experiment in making defined-contribution (DC) pension plans such as 401(k)s, often financed directly by workers’ savings themselves, the primary vehicle of private retirement security. This experiment has decisively failed. Overall pension coverage has not increased, and fewer Americans are in defined-benefit (DB) plans (think company pensions). The DB plans crowded out by DC plans were more secure, providing a guaranteed income for life that was not subject to the vagaries of the stock market. They were also much more equal than DC plans because they were employer-funded and participation was automatic (rather than workers bearing most of the costs and all of the risks). 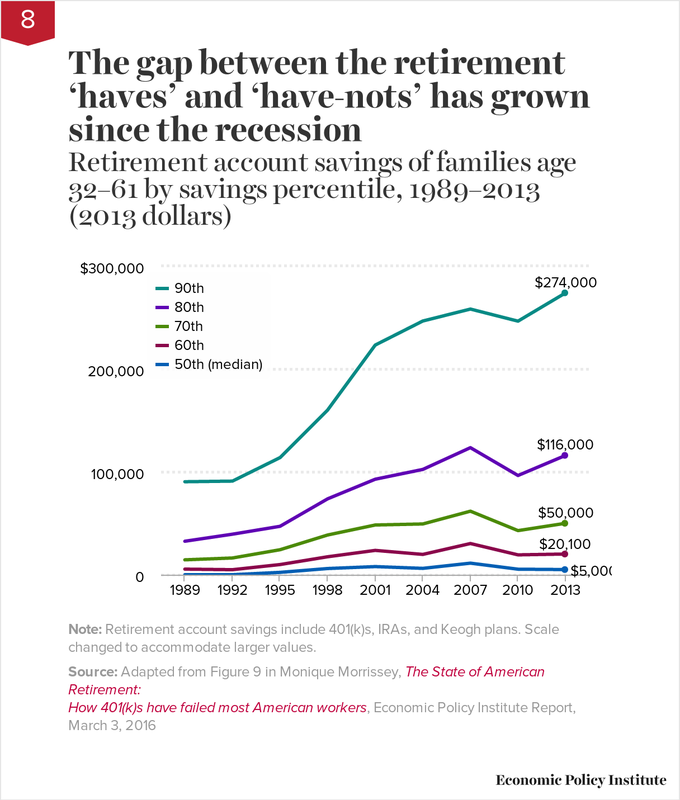 Nearly half of working-age families have nothing saved in retirement accounts, and the median working-age family had only $5,000 saved in 2013. Meanwhile, families in the 90th percentile of retirement savings had $274,000 in retirement, and the top 1 percent of families had $1,080,000 or more (not shown on chart). These huge disparities reflect a growing gap between the haves and the have-nots since the Great Recession, as accounts with smaller balances have stagnated while larger ones have rebounded. Note: For total government spending, government consumption and investment expenditures are deflated with the NIPA price deflator. Government transfer payments are deflated with the price deflator for personal consumption expenditures. This figure includes state and local government spending. 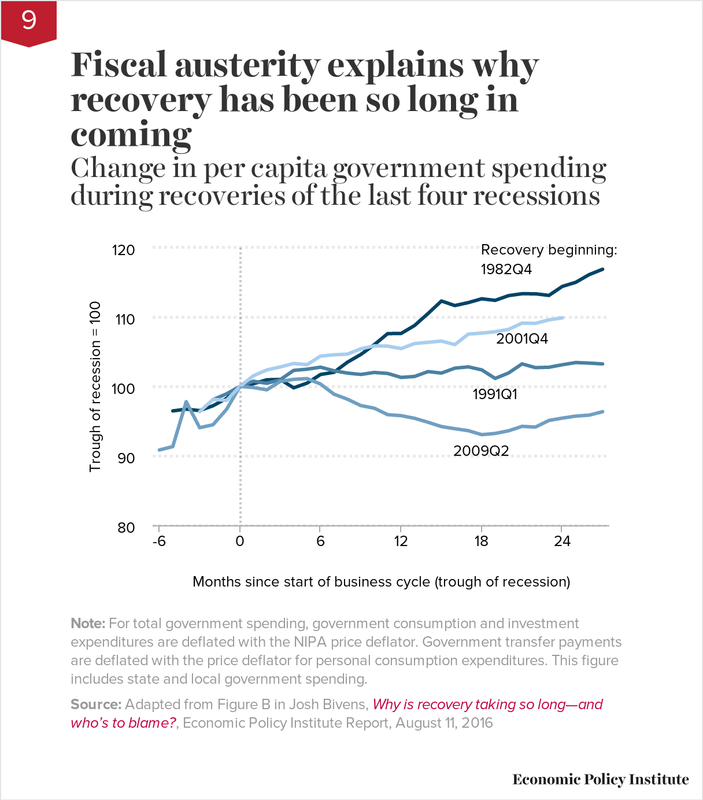 The agonizingly slow pace of recovery from the Great Recession is easy to explain: it is the result of austerity policies championed by Republican policymakers at the federal and state levels. Like every other postwar recession before it, the Great Recession was caused by a shortfall in aggregate demand, meaning that the spending of households, businesses, and governments was not sufficient to keep the economy’s resources fully employed. Despite the Great Recession being the sharpest and longest on record since World War II, and despite monetary policy reaching its conventional limits to boost spending early in the recession, policymakers made damaging decisions to limit public spending following the recession’s trough in 2009. This growth has been historically slow relative to other business cycles even as the economy needed substantially faster-than-average growth to mount a full and timely recovery. The figure shows the growth in per capita spending by federal, state, and local governments following the troughs of the four recessions. Astoundingly, per capita government spending in the first quarter of 2016—27 quarters into the recovery—was nearly 3.5 percent lower than it was at the trough of the Great Recession. By contrast, 27 quarters into the early 1990s recovery, per capita government spending was 3 percent higher than at the trough; 23 quarters following the early 2000s recession (a shorter recovery), it was 10 percent higher; and 27 quarters into the early 1980s recovery, it was 17 percent higher. *Nominal wage growth consistent with the Federal Reserve Board’s 2 percent inflation target, 1.5 percent productivity growth, and a stable labor share of income. The year 2017 looks to be the year that the Fed begins raising short-term interest rates in earnest. The Fed should raise rates only when it fears the economy is growing too fast and pushing unemployment low enough that workers are empowered to demand (and get) raises above what their productivity justifies. 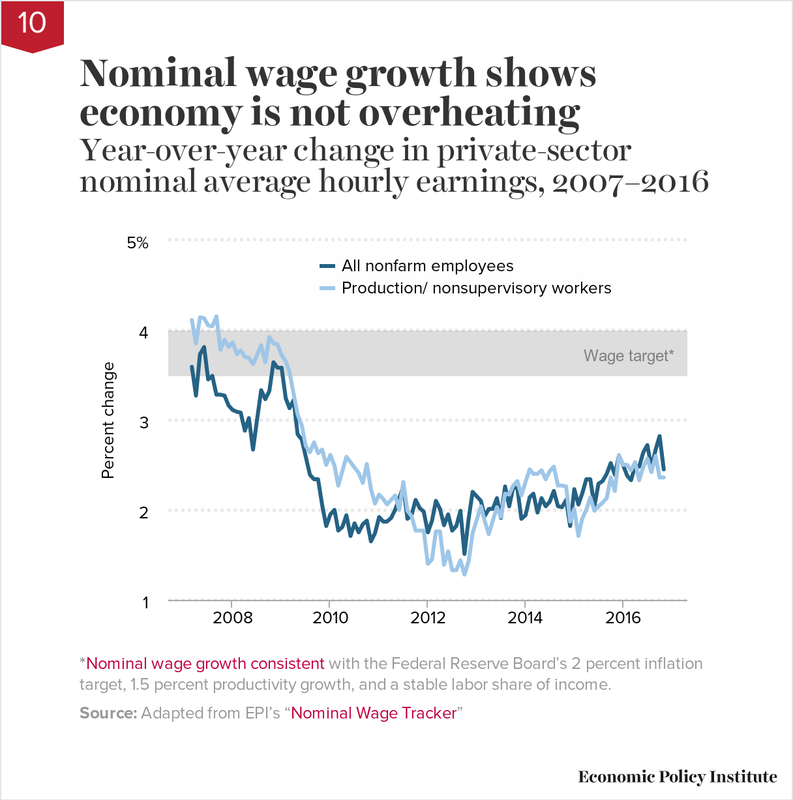 Data on nominal wage growth show that the economy is not getting overheated and thus a rate increase is not justified. The pace of economic growth should be considered unsustainable only when increases in labor costs force firms to raise prices enough to accelerate inflation above the Federal Reserve’s stated goal of 2 percent inflation. An absolutely crucial link in this chain is wage growth. If nominal (i.e., not inflation-adjusted) wages simply grow at the rate of economy-wide productivity, then wages are putting no upward pressure on prices. To see why, think of a 2 percent raise in hourly pay of a worker whose productivity (how much they produce in an hour) also rises 2 percent. The worker is getting 2 percent more, but is also producing 2 percent more. So the labor cost per unit of output is unchanged, and there is zero upward pressure on firms’ costs, or overall inflation. And the goal of Federal Reserve policy is not zero upward pressure on prices (or 0 percent inflation). Their stated target is 2 percent inflation. This means that nominal wages can grow at the rate of economy-wide productivity growth plus 2 percent before they are putting enough upward pressure on prices to make the Fed rein them in. EPI’s nominal wage tracker looks are how wages have grown over this recovery relative to a target of 1.5 percent (a common estimate of long-run, trend productivity growth) plus 2 percent. Nominal wage growth has been consistently below this target, meaning there is very little reason to worry about overheating in the economy. Reducing gender and inequality wage gaps and lowering unemployment enough to spur sustainable wage growth are absolutely essential steps if we are serious about restoring economic security to millions of working families. But a working labor market requires more than just jobs and wages. It requires a policy infrastructure that enables workers to enter the labor market and be productive in their roles as employees because they don’t have to make difficult choices between their careers and their caregiving responsibilities. * The sample included salaried (nonhourly), full-time workers who are 18 years or older. It excluded teachers (pre-K through college) and religious workers, who are automatically exempt from overtime protections. Note: The nominal threshold was set at $250 per week from 1975 until 2004 when it was increased to $455 per week. Under the Fair Labor Standards Act, all salaried workers under the threshold must receive overtime pay for hours worked beyond 40 per week. Work-life balance is a fundamental goal of the Fair Labor Standards Act (FLSA). Its requirement that employers pay hourly and lower-earning salaried employees a premium for time worked beyond 40 hours a week makes the FLSA the most family-friendly law ever passed in the United States. Excessive work is detrimental to family life, health, well-being, and productivity, and the law aims to protect workers who are junior enough that they can be forced to work extra hours. If not for the law’s overtime rules, tens of millions more workers would be working 50, 60, or 70 hours a week for no additional pay, just as millions of Americans did before the FLSA was enacted in 1938. But millions more are still dealing with this overwork and stress on families, in part because the salary threshold that determines whether workers are automatically eligible for overtime pay is set for a 1970s economy, not a 2010s economy. 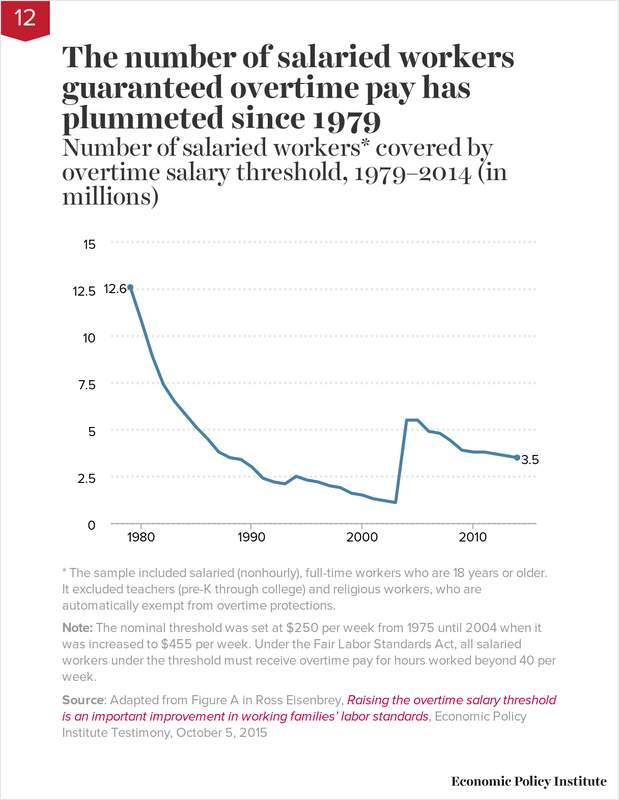 As shown in the graph, in 1979 more than 12 million salaried workers earned less than the salary threshold and were therefore automatically guaranteed the right to overtime pay, regardless of their duties. Today, with a 50 percent bigger workforce, only 3.5 million salaried employees are automatically protected. A new rule that guaranteed overtime protection to salaried workers making between $23,660 and $47,476 was instituted by the Department of Labor and was supposed to go into effect on December 1, 2016. But an egregiously bad legal decision has delayed enforcement of this common-sense rule. Note: Data on manufacturing employment are from Current Employment Statistics (CES) program of the Bureau of Labor Statistics (BLS). Data on Chinese trade balance are from the Census Bureau. As a share of GDP, the US/China trade balance was 0.00% in 1985 (first year of data availability). We assume this value holds for pre-1985 years as well. The presidential campaign often highlighted the decline of American manufacturing jobs. An incorrect conventional wisdom among economic commentators holds that the decline of manufacturing employment has been driven by automation. This explanation does not fit the facts. Manufacturing employment was actually quite stable (aside from business cycle fluctuations) for 35 years between 1965 and 2000. But certainly there was plenty of automation between 1965 and 2000. Indeed productivity growth (a proxy for automation) was just as rapid in those years as thereafter. But 3 million jobs were lost in the 2001–2003 recession and jobless recovery from that recession. Then rapidly growing trade deficits—particularly with China—kept the subsequent recovery from aiding manufacturing jobs. This meant that manufacturing entered the Great Recession without having regained the jobs lost in the previous recession, and in fact having lost a small number more as the rest of the economy recovered. 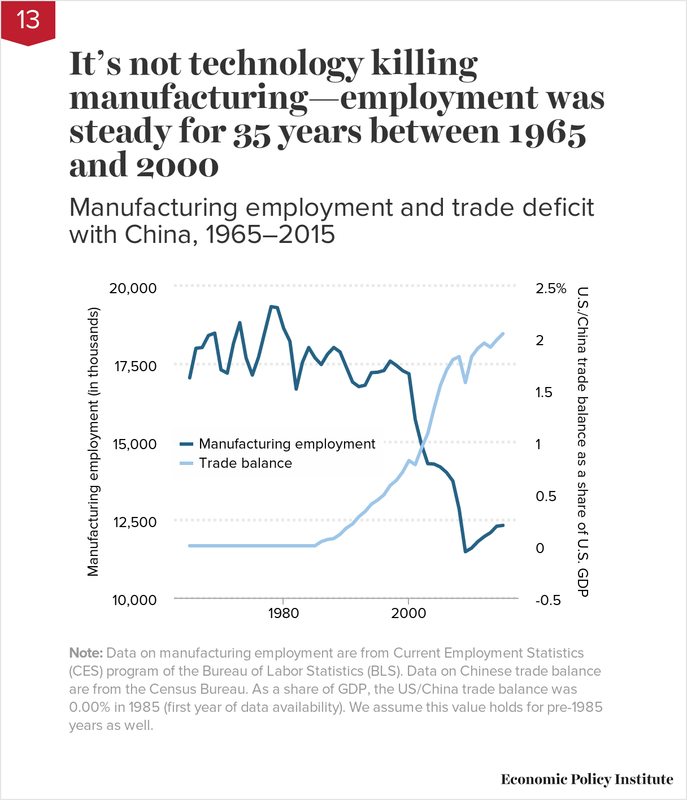 As a result of two recessions and the “China shock,” the manufacturing sector today has nearly 5 million fewer jobs than it did in 2000.